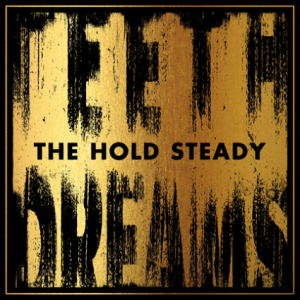 The Hold Steady’s new album, Teeth Dreamsm is the friend who moved to the burbs and grew up. Sure, the opening track “I Hope This Thing Didn’t Frighten You” will remind you of drinking too many cheap beers with your old pal in the back of many a black-walled dive bar like any signature The Hold Steady song should. The rest of the album will play like the day your friend met the person he couldn’t live without and you knew it was over. For The Hold Steady, that day was probably when their iconic mustachio’d keyboardist Franz Nicolay left back in 2010, and this album serves as a painful reminder of what’s been missing ever since. Your friend still plays guitar in the basement and maybe even rocks with some of the other guys in the neighborhood, but it’s not the same. The Hold Steady brought in a new guitarist, but their sound has gone soft, and they’ve lost their Brooklyn edge in favor of something more Nashville-friendly. Unfortunately, for an album with so many songs about anxiety, Teeth Dreams plays like your friend driving his sleepy kids home in his minivan, on cruise control.